(*) Parnapuan was the name of Dr. Paulo Santos Cruz Kennel. 14-year life with Dr. Paulo he showed me very few pictures of his dogs, reminding my readers that for more than 50 years, photographing was not so easy as it is today in the digital age. 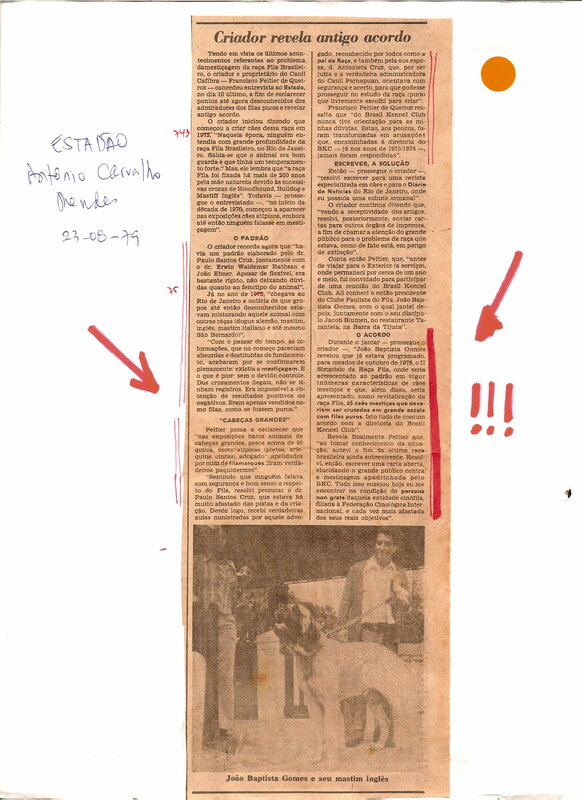 These 12 photos are indeed Parnapuans Filas by the simple fact that Dr. Paulo selected them and sent them to Luiz Hermanny to publish in his book that contains four chapters on the FB written by Dr. Paulo himself. Conclusion: photos that were chosen and selected by João Batista Gomes, Procópio do Valle, Jacob Blumen and Clélia Kruel, as well as cross-breeders, dog merchants and the inventor of the OFB, informing that a particular photo is from a dog from the Parnapuan Kennel and are used to justify and validate diverse phenotypes, miscegenation, dog trade and a new canine type like OFB, absolutely nothing should mean to the educated and intelligent Filas fans who really know the True History of FB… Let´s stop the so called “blindness of kennel or breeding” and also the inflated ego !!! 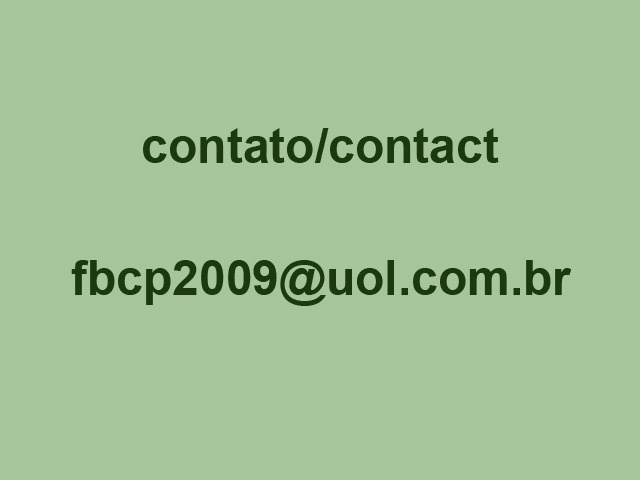 In addition, all knowledge in FB of Dr. Paulo was fully consolidated in the Standard, Regulations, articles in the newspaper O Fila and, in practice and with total success, in the Fila-CAFIB, with the invaluable contribution of the founders and first CAFIB breeders. Therefore, it is no use for the innovators to sprout “fila–mestizos” or even Regular Typical Filas to try to prove their inventions. 3. It is important to emphasize that, over the last decades, many were the photos of “mestizo-filas” and “fake-filas-photos” that were used to give credibility to diverse theses that basically defended the “mestizo-filas“, mainly the “mastiff-fila” types, the “black-fila” and more recently the “fila-chihuahua-giant“. 4. Certainly the greatest example of “fake-filas-photo” is the below, where this “mastodon-fila“, precursor of the “freak-fila“, won an article written by Jacob Blumen in the magazine Animals & Veterinary # 11, dated 1976, before the CAFIB foundation, as the FB photo named Orixá de Parnapuan, whose author induced it to be, but never was, from the Parnapuan Kennel breeding of Dr. Paulo. 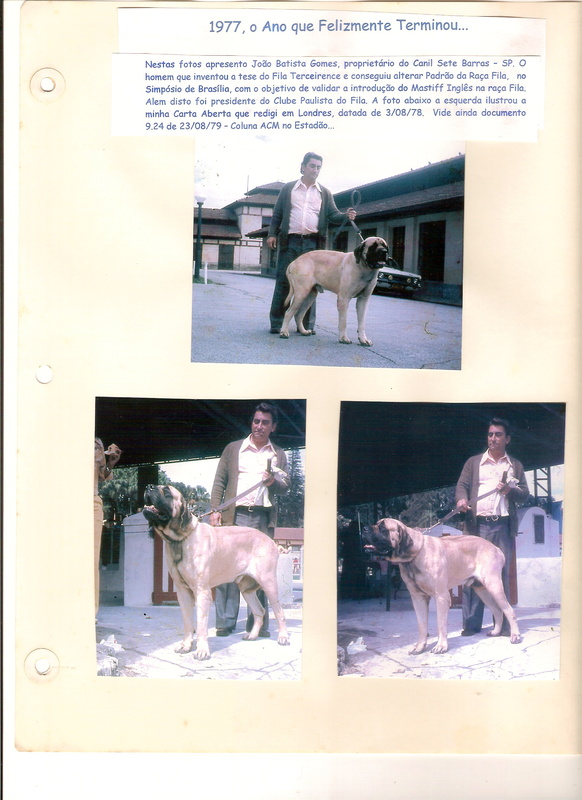 That is, the first cross-breeders of the FB with English Mastiff tried to sell and instill in the minds of the new FB fans and breeders of that time, when unfortunately the FB became fashionable in Brazil and abroad, mainly in the USA (*), that in the legendary and traditional Parnapuan Kennel was born such “mastodon-fila“, with the characteristics of the dog below, similar to those of the “fila-mastiff” because it was in this absurd phenotype (**) that they wanted to transform our beloved, traditional and ORIGINAL Fila Brasileiro. (**) this “mastodon-fila” below from yesterday (1970 decade) , is nothing more than the forerunner of today’s “ freak-fila” !!! You can confirm what I write by reading in Portuguese: “Orixá of Parnapuan, the Brazilian giant, true prototype of the Fila Breed with 110 kilos (= 242.50 pounds ) of body weight“. My dear friends, would you please tell me how the 12 FBs actually of Parnapuan origin from the photos published in the book above and dated before 1957, with half this weight and half this extremely large body, may have generated this “mastodon-fila” photographed 20 years later and presented by the adepts of the FB miscegenation as being a true Parnapuan Fila ? Of course, it is a mestizo dog, yesterday or today, with a FB pedigree of issued by any Office Registry of Dogs that act commercially and is completely unaware of the Fila Brasileiro Breed ? http://www.filabrasileirochicopeltier.com.br/fotos/1843.jpg and based on the following experience denounced by me in http://www.filabrasileirochicopeltier.com.br/9-Documentos-ate-1979/9-24.jpg and carried out without any control, which was used unbelievably in the simple and pathetic pedigree counterfeit and falsification!!! Therefore, besides not being ethical to use “fake-photos” of dogs not Parnapuan, I believe that it is also unethical to use Dr. Paul’s name because he would disapprove, no doubt, of the above OFBs. 6.8. Any personal and egocentric achievement projects can never be above the Fila Brasileiro. 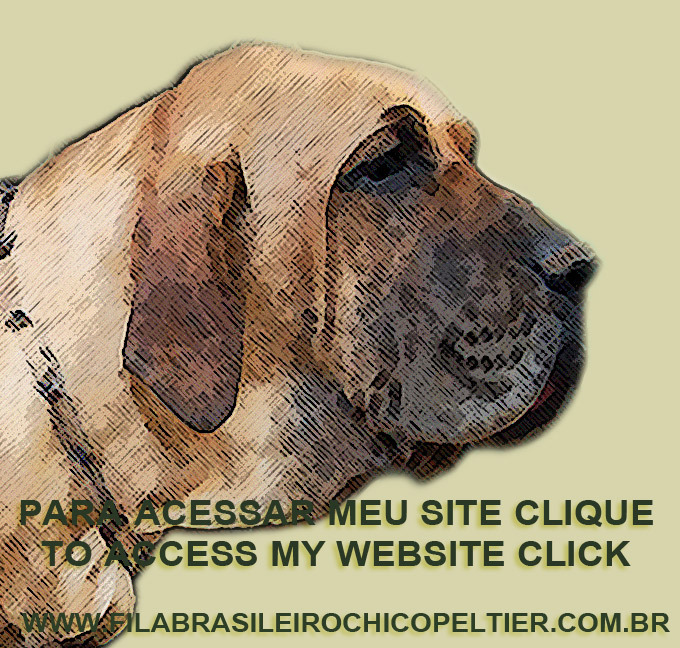 For my part, I will always continue to defend our beloved, traditional and ORIGINAL PURE Fila Brasileiro ever.